As a student of successful ‘branding’, I’ve always been fascinated by the branding success of one of my favorite restaurants in New York City, Patsy’s on West 56th St. It happens to have been the favorite restaurant of the late, great Frank Sinatra who was one of Pasquale Scognamillo’s first and best customers. (Pasquale was shortened to ‘Patsy’ at his entry to America on Ellis Island.) In fact, the owners of Patsy’s will tell you it was the three ‘F’s that made them famous. Food, Frank Sinatra, and Family. But there is so much more to this incredible brand success. Patsy’s has been in the same location for over 70 years, owned by the same family for over 70 years, with pretty much the same great menu for over 70 years. While I only get to New York on occasion, I never go to New York without at least one meal at Patsy’s, because not only is the food great, but even though I’m not a star or a celebrity, I feel the welcoming love of this family operation just as much as every great name that has made Patsy’s their home away from home. Talk about a who’s who of celebrities…just look at the pictures on the wall! Of course, Sinatra and his family. Tony Bennett (who sat at the next table on my first visit). Burt Lancaster. Sylvester Stallone. Aristotle Onassis. Jackie Kennedy. Dustin Hoffman. Tony Danza. Liza Minelli. Rush Limbaugh. Salvador Dali. Pablo Picasso. But unlike many eateries with pictures on the wall, every one of Patsy’s famous visitors has a story to tell. It’s more than a meal, it’s a personal relationship with the three generations of the Scognamillo’s. Many of these stories told in endearing terms on the pages of Patsy’s cookbook that reads more like a fascinating novel than a cookbook. Like the Jackie Gleason ‘suckling pig story’, or the night Aristotle Onassis had to bang on the door after hours to get in. Or the Thanksgiving that Patsy’s ‘staged’ an opening just to make their friend Frank Sinatra feel loved at a difficult time in his career. And how about the time Picasso wanted to give Patsy a painting and he politely refused!! If you want to read some of these great stories intertwined with many great Patsy’s menu items, go to the website and order the first cookbook …the one with the darker cover. Although I have both of their cookbooks autographed by Sal Scognamillo, I like the first one the best for all the inside stories. Better still, next time you’re in New York, make a reservation (make sure Sal is on that day) and ask Sal to autograph a copy for you! He’ll do it with a smile and you’ll instantly be one of the family. So what makes Patsys such an indelible, memorable brand success? You’re both at Patsy’s! Most retailers today know the significance of ‘ambassador’ customers. Those influential customers who share their stories of satisfaction with friends, family, co-workers, and postings on public social media sites and reviews. And then there are the VIP customers who often pay a premium for premium service. Premier/VIP seats at theatres and special events are the first to sell-out. It seems like everyone pays for the ‘no waiting’ lines at Disney! But at Patsy’s, every customer that walks in the door is treated like a VIP…no extra charge. Every customer is shown great hospitality as if they had received a personal invitation to a special party. Even if you end up sitting next to a big star, you’ll get the same friendly smile from ‘My Pal Sal’, the third-generation master chef, Sal Scognamillo, (pronounced Scon-ya-millo), one of the owners, as he walks through the dining room. And you won’t feel rushed. You’ll feel top tier! Sal has a smile that lights up the room and makes anyone and everyone feel appreciated. And then my friend, you too will be an Ambassador. Every person I’ve ever introduced to Patsy’s has become an ‘Ambassador’. Every truly successful great brand has a story. Patsy’s is a master at telling their story. Like I said, the first cookbook is more like a fascinating novel with the history of the restaurant and anecdotal stories of the relationships with so many famous folks, past, and present. Patsy’s website does a great job of telling the story as well. Seems like everyone who has visited has their own ‘Patsy’s’ story..but it all winds up at the same place… food and family. (and of course, everyone has to tell you it was Sinatra’s favorite restaurant!) 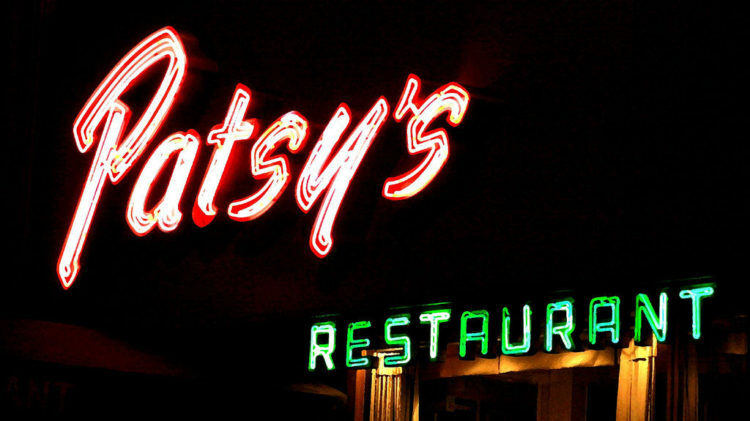 You don’t have to spend a lot of time explaining Patsy’s to people in the NYC area. When you say let’s have dinner at Patsy’s, they know exactly what to expect. I know ‘personal service’ sounds like a worn cliché but Patsy’s defines it. When you call for a reservation, the person taking it (usually one of the family) gets your name right and gets the details right. They answer your questions intelligently because they truly know what’s going on. Got a special request? They’ll get it right. When you show up, you’ll be greeted like you are actually expected! And you’ll be greeted by someone who is actually happy to see you, not like you are an interruption to their activities. Consistency You Can Count On! If you really enjoyed one of Patsy’s specialties back in 1988, you’re going to enjoy it again in 2018 because it’s the same! There have only been three master chefs in their history! Patsy, then his son Joe, then Joe’s son Sal. And chances are pretty good one of Sal’s sons will take over someday. The same recipes that Patsy brought from Italy, handed down generation after generation. The same insistence on only the best ingredients. The same determination to make every meal meet the customers greatest expectations. Patsy’s is not a huge restaurant. They have no plans of getting any bigger or opening additional locations. Frank Sinatra once asked if they would consider opening a location in California and was told no…it just wouldn’t work with the family goals of consistency and control of their brand. I’ve never been to Patsy’s when it wasn’t busy. But I’ve never seen a line outside because people know a reservation is important, and Patsy’s is very good at managing their business to accommodate reservations in a timely manner. If you’re a fan of the Godfather movie series, you’ll know that Patsy’s was mentioned in the movie as a scene where one of the Corleone family members was dispatched. The filmmaker wanted to do the shoot at the restaurant but Patsy’s said no. They didn’t want a disturbing scene burned into customer’s minds, relating to their brand. Now some restaurants would jump at the chance to have a location scene. Patsy’s put their brand first. Back when jackets were required, a number of celebrities were asked to wear a ‘house jacket’ when they showed up without one. Jackie Kennedy was supposedly rankled when they asked her son John to wear a jacket. But he did. That was the house rules. For everyone. By the way, jackets are no longer required…just business casual. Building and reinforcing your brand in any business today is not only the secret of long-term growth and profitability, a strong, identifiable brand is the only thing that sets you apart from the competition who spend all their advertising efforts on promotion and gimmicks. Now is the time to evaluate your marketing budget. At least half should be going to ‘share of mind’. The things that separate your enterprise from the rest of the pack. Your unique perception. Your story. Your brand. Lots of restaurants in New York serve Italian food. Only Patsy’s serves up the kind of experience that has kept customers coming back for 70 plus years…with a reputation bringing in new ambassadors-to-be every day! Interested in discovering your dealership brand? Fill out the form below for a consultation with our team. Photo by Flickr User Thomas Hawk via Creative Commons.